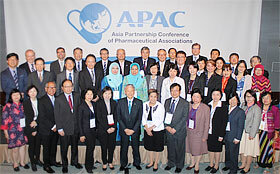 The fourth Asia Partnership Conference of Pharmaceutical Associations (APAC) was held on 9-10 April at the Palace Hotel Tokyo. Out of 13 IFPMA members in Asia, this conference was attended by 11 pharmaceutical associations from China (RDPAC), Hong Kong (HKAPI), Indonesia (IPMG), Malaysia (PhAMA), Philippines (PHAP), Singapore (SAPI), Korea (KPMA and KRPIA), Taiwan (IRPMA), Thailand (PReMA) and Japan (JPMA). In addition, participants from IFPMA, Interpharma, government officials from Indonesia, Korea, Malaysia, Myanmar, Taiwan, Thailand, and Japan (Minister of MHLW, MHLW, PMDA and AMED) were also there to participate in the conference and reception, bringing the total number of participants to approximate 300 altogether. RA-EWG has been advocating the concept of good registration management, under which execution of both Good Submission Practices (GSubP) and Good Review Practices (GRevP) by the applicants and the reviewers, respectively, will enhance the performance of both submission and review, leading to efficient and quick drug registration/approval. As the industry initiative and proposals, the team prepared the APAC GSubP guideline and APAC position paper documents, both of which were endorsed at the 4th APAC convention. APAC GSubP guideline is developed to improve the quality of submission dossier and its management. APAC position paper is intended to further improve the transparency, predictability and timeliness of drug review by facilitating communication with the reviewers. RA-EWG anticipates that these activities will support the GRevP by the review authorities. DAEWG strives to continue developing a platform for open innovation through three core activities: the provision of opportunities for information sharing in research, the promotion of networking in development, and drug discovery capacity building for researchers. By means of these core activities, we will provide solutions to our challenges in collaboration with our stakeholders. At the 4th APAC, we introduced above-mentioned activities as a consensus of this year. Attached is a concept paper described our activities in detail.